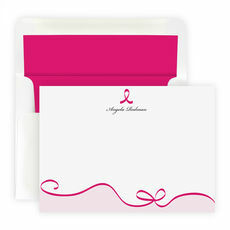 Set of pink ribbon foldover note cards. Flat printed in typestyle and ink color only as shown. Size 5.5" x 4.25". Blank envelopes included. Printed return address in flat black ink available. Optional hot pink envelope linings available. Positioning only as shown.